Guangzhou respiratory specialists have developed a simple and inexpensive alternative to spirometry for diagnosing COPD in Chinese primary care settings. 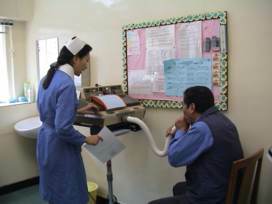 Writing in the Journal of Thoracic Disease, Dr Cui Jiangyu and colleagues at the Guangzhou Institute of Respiratory Diseases, The First Affiliated Hospital, Guangzhou Medical University, say that although spirometry is the “gold standard” for COPD detection, it is underused in primary care settings, particularly in China because it is expensive, requires skill to operate and is unfit for some patients. They have previously shown that in China, only 6.5% of patients with COPD had ever been tested by spirometry. "Thus, it is of great value to develop a simple and economical method which can be used as an alternative option for spirometry to screen COPD and to predict the COPD stage in primary care settings. They therefore developed a nine-point screening tool based on data from 243 COPD patients and 112 non-COPD subjects from a COPD survey in urban and rural communities and local primary care settings in Guangdong Province, China. The nine factors used to test for COPD included age, gender, smoking, body mass index, occupational exposure, living environment, wheezing, cough and dyspnoea. In testing the model they found that the sensitivity, specificity, positive likelihood ratio, negative likelihood ratio, accuracy and error rate of the function model to discriminate COPD were 89%, 82%, 4.94, 0.13, 87% and 13%, respectively. They conclude that "Our study tentatively developed a discriminant function model consisting of nine variables which can be applied to screen COPD as an alternative option in areas where spirometry is unavailable. To our knowledge, no previous study used a discriminant function model to screen for COPD, though the same way has been used in the diagnosis of other diseases." "In addition, our discriminant function model can also be used to predict the stage of COPD, with an accuracy of about 70%," they add. "In conclusion, the discriminant function model reported here is a first attempt of its kind to develop an alternative method for the COPD screening in Chinese settings. We believe that it may help diagnosis early enough a great number of COPD patients who may not be diagnosed otherwise and the early diagnosis can allow them to have a timely medical treatment."